Can you just say that every stop in a journey is a special one? It feels like I've been doing a lot of that. But this one is, it really is! Adelaide has been visiting my sister, Rhiannon. Which also means she is so close, so close, to coming home to me! 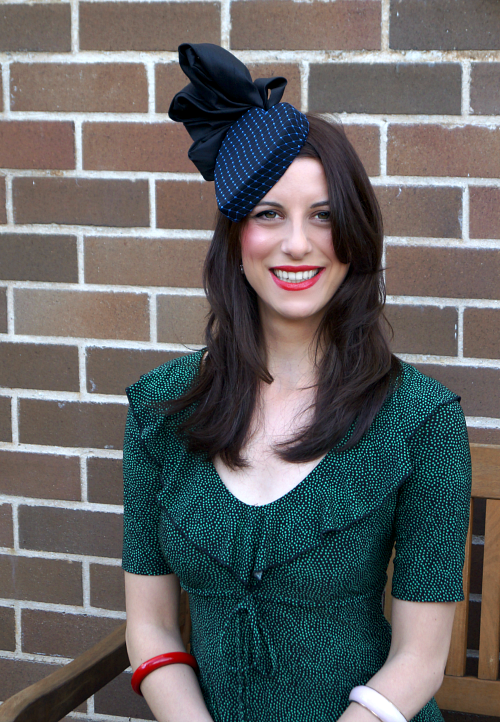 Rhiannon chose to try Adelaide with a few different outfits, with vintage and modern twists. This is a more modern one. 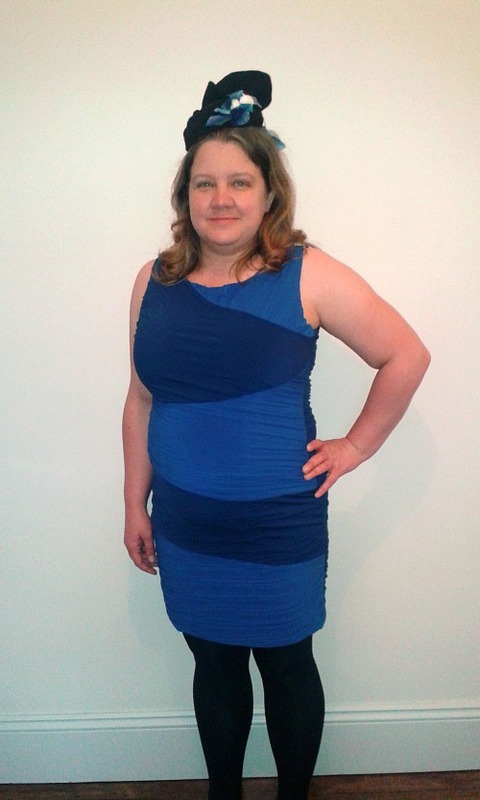 I love all the blues together! 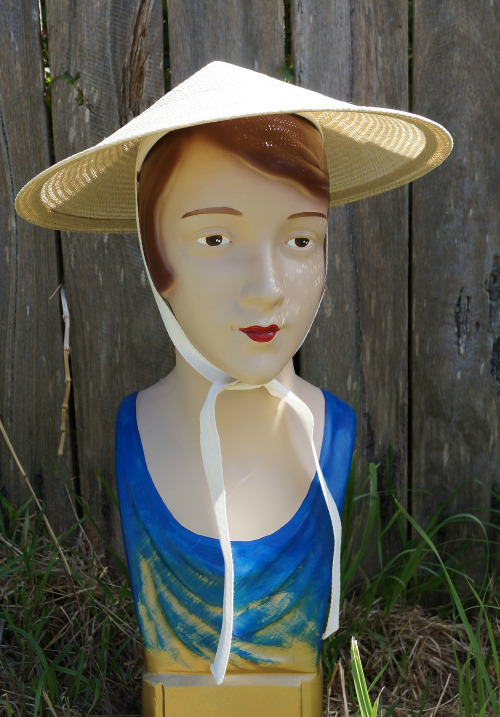 Pop on over the Rhiannon's blog, Parlour Duck Crafts, to see the rest of the outfits. Meanwhile, I'd better get on with planning my own! A standard dome hat block is one of the most useful tools I can imagine in the millinery world. As much as I love special shapes of block, the dome is unbeatable for versatility and usefulness. 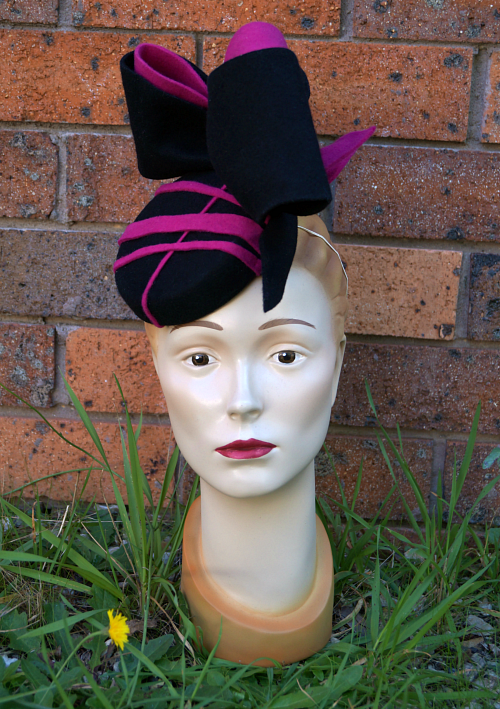 But if you are just starting out in millinery or just having a bit of fun with it, even one block is a big investment. There are hat-making methods other than blocking, like making flat pattern hats from fabric or on a buckram foundation, but blocking really is fabulous. It is fun and creative and opens up all kinds of possibilities. 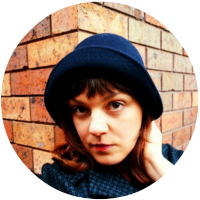 It is true that if you want to block a hat with a nice round crown that fits closely to your head, like a cloche for example, a hat block is going to be pretty necessary. But there are many other shapes of hats out there, especially when it comes to tilt hats. I do believe it would be easier to learn how to block straw, felt, sinamay or buckram on a proper hat block first, then start to experiment, but it is not at all necessary. And if you learned on someone else's block, in a class for example, then didn't want to buy your own right away, you should consider some other options. Let me share with you some examples of my own where I've used alternatives to proper hat blocks. First, random objects totally unrelated to millinery. Once you start looking at objects as possible blocks, it will be hard to stop. Make sure you consider whether the material of the object can take the pressure of blocking, and how you will hold your blocking material in place. Can you pin into the object? Tie string or rubber bands around it? Blocking felt in particular can take a lot of force, so fragility is a consideration. Also how susceptible might it be to steam or moisture, and how well can you cover it (usually with plastic wrap) to protect it? I did block this felt on a glass vase, it's true. In hindsight I am not sure I would try that again. I used string to hold the rings in place around the bumps of the vase, and everything turned out alright. In my defence, it is a very sturdy vase. This one was, I believe, a flower pot. But I'm not sure. It could have been a cookie tin. Much sturdier than glass, anyway. Since I couldn't use pins here either, rubber bands held the shape in place. Not that you can see much of the shape here under the fluff, but the foundation for this hat was blocked on a large wooden bowl. I was able to use pins, which is good because the size might have made elastic more tricky to use. I always keep an eye out in op shops for wooden serving dishes and other bits and pieces. I have a lovely little pineapple blocked and waiting to be finished! 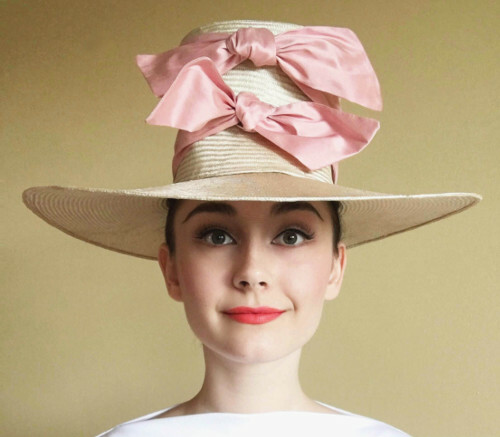 For this reproduction of a hat from Funny Face, the crown was blocked on a shape I made out of cardboard. I originally had the cardboard over a flower pot for added strength, but as I worked and changed the size, it became a cardboard-only block. Since the straw is a very good quality and blocks easily, the strength was still enough. The tilt hat in my Nora Finds collaboration collection, was blocked on an improvised combination of two small wooden objects. I think one of them was the turned wooden lid of a glass jar, and one was the base of some kind of stand. I placed them together the way I wanted and wrapped them up tight in aluminium foil. With the freehand swirling on top, the exact shape didn't matter too much, but it gave me the right base I was trying to achieve. I was lucky enough at one point to have some round hat blocks turned for me on a lathe, but you don't need access to those skills or tools to create a hat block. If you do have some woodworking tools available, simple cut-out shapes using a band saw or similar are very easy. 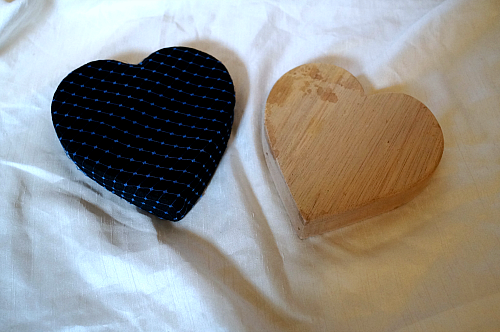 I made my round and heart-shaped pillbox blocks using a band saw and some scrap wood. Pillbox shapes are a great one to make yourself, and such a useful block to have as well. You can achieve the same result (at least with fabric covered hats) using a flat pattern, but this is quicker, as well as allowing you to work with felt too. Both styles of pillbox have been used many times by me! There are also options for carving blocks out of foam (I have done a class on this but haven't tried it since and I know it has to be the right type of foam) and I'm sure many more possibilities. Not all of these are going to last as long, and possibly aren't ideal choices for a beginner anyway! So technically this isn't without a block, but I have also heard beginner milliner's with only a dome block complaining of needing more shapes and more options. I can't fault anyone for coveting more blocks, but there is so much more you can do with the ones you have! 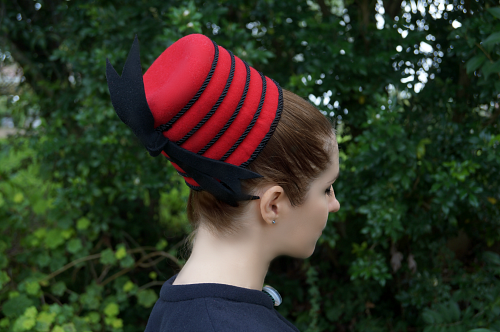 I added a small sweets tin to the top of a dome to create this felt hat. I covered the hat block, taped on the tin, and covered both together, then blocked. Easy peasy! The block for this cone hat (made for the lovely Kate at Retro Rover) was technically built from cardboard, but I did use a sloped brim block beneath it to add strength. I'm not sure if that was necessary, so this could potentially be one you could do from scratch. Keep in mind, though, that the right materials are key. Stretching a normal capeline to this shape may have been a nightmare, but I got advice from my supplier and used a buntal mat instead, which has a less rounded shape. It was perfect and a dream to work with. If you've been on the fence about trying blocking, or putting off getting back into it because of the cost, consider seeing what else you have around the house, or can find cheaply, that could make a nice little hat shape. Did any of these examples surprise you? I like to think they hide their secrets well!